The DYNAMIC SYSTEM KUNG had been and created on the principles of base that correspond to the essential qualities for an efficient fight and a personal defense from road. The followings principles hide in if great truths without which every effort of progression would be vain in the ability of the Kung Fu. Now analyze these principles, it will be your practice that will take you to them, and they to the practice, as the "Tao," which in the infinite movement of the wheel opposite truths. Search your feelings, the essence of art, and these principles that you may seem trivial, will gain the true value they have. Like any self-respecting school has a scale of degrees that attest to their level of awareness of Martial Art in which they are practicing. The level of preparation is well marked by colored bands, which, however, are only a point of reference to improve. - 1st Grade "Jichu" (white belt optional). - 2st Grade "Jichu" (orange belt). - 3rd Degree "Jichu" (Green Belt). - 1st Degree HIGHER "Shang" (belt compulsory Black + Red 1 notch). - 2nd Degree HIGHER "Shang" (Black Belt mandatory + 2 Red notches). - 3rd Degree HIGHER "Shang" (Black Belt compulsory + 3 Red notches). - 4th Grade SUPERIOR "Shang" (Black Belt compulsory + 4 Red notches). - 5th Grade SUPERIOR "Lao Sh�" (Black Belt obligatory + 5 notches GOLD or Yellow). The degrees are recognized by the National Sports Center Educational. 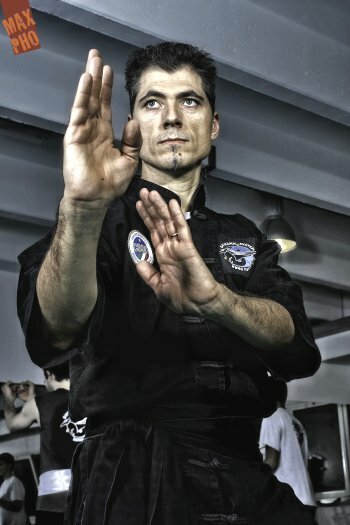 For each degree is paid a well-defined program of techniques, forms, applications, athletics, philosophy, and behavioral attitudes, and instructors must attend and pass the instructors course lasting approximately 30 hours, and training courses held by the Technical Director the Dynamic System Kung Fu.